In Baltimore, Maryland, seven police officers were recently charged with federal racketeering, fraud, and extortion, according to Vice News. The crimes that some of the seven Baltimore police officers are being accused of include stealing from suspected trap houses, robbing citizens of drugs and money at traffic stops, reporting overtime pay while at a casino, and conspiracy to sell heroin. According to Baltimore Police Commissioner Kevin Davis, “These officers are 1930s-style gangsters, as far as I’m concerned.” In fact, federal racketeering charges originated in 1970 with the Racketeer Influenced and Corrupt Organizations (RICO) Act in order to combat mafia activity. 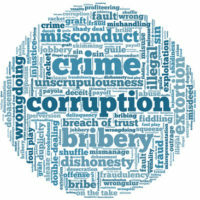 Racketeering offenses can be prosecuted at either the state or the federal level. The punishments for committing a racketeering offense are great at both the state and federal level. Racketeering is the crime of offering a dishonest service in order to solve another party’s problem-a problem that the racketeer themselves created. For example, through extortion, a racketeer could provide a “service” of protecting a small business from vandalism and theft for a monthly fee, and if the business owner declines the offer, the racketeer would cause damage to the store. There are 35 crimes that fall under racketeering under the RICO Act. A racketeer can face up to 20 years in prison and a fine of $25,000 for each racketeering offense, or up to twice the illegal profits of the racket. Any person or entity to conspire to violate any of these provisions. Committing any of these offenses will result in a prison sentence of at least five years and up to 40 years, in addition to a fine of up to $1 million. A second offense is subject to a Class 2 felony and a fine of up to $2 million, as per Virginia § 18.2-515. Racketeering is an offense that incurs incredibly harsh penalties. You may be facing decades or more behind bars and fines that run into the millions. However, we can help you fight these charges and have your punishment greatly diminished or the charges thrown out entirely. Contact the Leesburg, Virginia racketeering defense attorneys of Simms Showers, LLP today at 703-997-7821 for immediate assistance.